But I never heard you complain. with a hug, advice, or bandaid. your home was a haven to me. and all that you mean to me. my dearest Aunt Pat "Mom". I've often wanted to make a page paying tribute to my Aunt Pat, but I've never been able to settle on the words I want to say. Nothing I ever write down expresses the feelings I want to share. I don't think there are words to say exactly how I feel about this wonderful woman, my mother's sister, my Aunt Pat. When I was a little girl, my parents divorced. They went their own ways, met new people, made new lives. My mother happened to meet a man who had family in Detroit and for some reason they decided that was where we were to live. I don't know all the circumstances that led to the decision for my brother, sister and me to live with Aunt Pat and Uncle Nip. I've never asked, it wasn't important. The fact is, we did move in with them and my four cousins in a small three bedroom farm house in Iowa. It was a tight squeeze. My sister and I moved in with Bev and Becky, and my brother moved in with Bart and Brad. Seven kids in two rooms...Aunt Pat and Uncle Nip must have been crazy. Surprising as it sounds, I don't remember any real problems. Sure, there must have been arguments and adjustments, but I don't remember them. I remember playing Barbies with my cousin Becky and using a shoe box as Ken's car. I remember Aunt Pat making homemade applesauce and yogurt. I remember their dog Cookie. And I remember when all of the kids got chicken pox except me! Mostly, I remember asking Aunt Pat if we could call her "Mom" like the other kids, and she said yes. It wasn't that we were forgetting my real Mom, or that we wanted to replace her. We talked to her on the phone and wrote back and forth to her. We missed her and wanted to be with her. But time rolled on. I don't know exactly how long we lived with Aunt Pat and Uncle Nip but it seems like we were there for most of my third grade year. Looking back, I think we just needed the security, the feeling of safety that comes with the word "Mom". We called Uncle Nip "Dad", too, and to this day when I hear the word father, I think of him. I'm sure it wasn't easy for them. They weren't rich by any stretch of imagination. I don't think my Mom contributed much money (if any) while we were in Iowa...but I never heard that from Aunt Pat and Uncle Nip. They treated us as if we belonged with them, like we were their own and my cousins treated us like siblings. I've stayed close to my cousin Becky. We even had our first babies "together", my oldest daughter being born less than two weeks before her son. We don't see each other very often these days, but I still consider her my "sister-cousin". One last thing I remember about those days with my Aunt Pat "Mom". When we went to Detroit, Aunt Pat cried. Aunt Pat had to move down south a few years ago for health reasons. I hardly ever see her but we email each other and we talk on the phone occasionally. 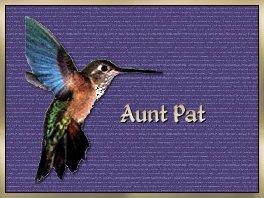 But the fact remains, no matter how much time goes by or how many miles separate us, Aunt Pat will always be on my mind and in my heart. Aunt Pat, I love you.